This article provides troubleshooting steps for the ‘Camera Failed’ error on both the Samsung Galaxy digital camera and built-in cameras on Samsung Galaxy smartphones. The ‘Camera Failed’ error doesn’t include any kind of error code or any details about why the camera isn't working properly. That makes troubleshooting difficult. It’s not impossible to fix this error, though, since in most cases it’s a simple software error. The error can be caused by an incomplete firmware update, third-party apps that are out of date, or even by an SD card the camera suddenly – and mysteriously –doesn’t recognize. 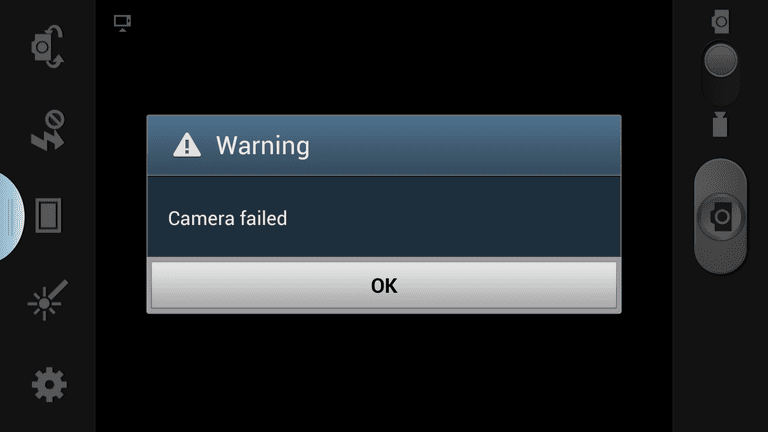 You may have to try several strategies to fix the ‘Camera Failed’ error on the Samsung Galaxy camera. Try these steps, from simplest to most complicated. Before trying any of these troubleshooting steps, ensure your camera's battery is fully charged. Some steps could take several minutes to complete, and if the battery isn’t sufficient to support the time needed to complete the step, you may encounter other errors and have to start the troubleshooting process over. Restart your camera. Many issues that cause software errors can be reset with a simple restart. On the Samsung Galaxy camera, press and hold the Power button to turn the camera off. Once it’s off, allow the camera to sit for at least 30 seconds before powering it back on. Power up in Safe Mode. Turn the camera off, then press and hold the Power button until the Samsung logo appears. Immediately slide the Zoom button to the minus position and hold it there until the home screen appears. Then release it. You should now be in safe mode. Check to see if your camera is working properly. If it is, the problem could be a third-party app conflicting with the camera software. Restart your camera and remove recently installed or updated third-party apps one at a time until the problem disappears. The Fast Power-On feature must be disabled in order to boot into Safe Mode. To disable Fast Power-On go to Apps > Settings > Power then tap Fast Power-On to disable it. Clear the camera app cache and app data. From the Home screen go to Apps > Settings > Application manager, then swipe right or left to get to the All tab. Once there, tap Clear Cache. Once the cache is cleared, restart your camera and try to use it to determine if the error has cleared. Clear the cached data. From the Home screen go to Apps > Settings > Storage. Tap Cached data. You'll be prompted to confirm you want to clear your cached data. Tap OK to confirm. Remove, then reformat the SD card. Occasionally the Samsung Galaxy camera will encounter an error reading the SD card, which can cause the ‘Camera Failed’ error. To resolve the error, power off your camera, then remove the SD card. Power the camera back on and reinsert the SD card. If prompted, reformat the SD card. Reformatting an SD card will erase all the data on the card. If you have pictures on the card you don’t want to lose, try transferring them to your computer using an SD card reader. If you're not prompted to reformat the SD card and you still encounter the error after removing and reinserting it, you can manually reformat the SD card by going to Settings > Storage > Format SD card. Reformat your camera’s SD card using the instructions above. You need to start this step with a clean, empty SD card. Connect the camera to your computer with a USB cable. You should be able to find the camera’s SD card as a USB drive on your computer. From the Samsung Support site, download the correct firmware for the model camera you have. This should download a ZIP file. Once the download is complete, expand the ZIP file and then copy the file that ends with .bin to the SD card on your camera. Disconnect your camera from the PC. On your camera, go to Settings > Device Information > Firmware Update, then select OK. Select Body Update from the menu that appears and the update should start. Don’t be alarmed if the camera restarts several times during the update process. Once the update is complete, restart your camera and check to see if the issue is resolved. When all else fails, do a hard reset. Wait 30 seconds, then press the shutter button halfway down and hold it in that position while you press and hold the Power button until the camera starts to reboot. Release the power button but continue to hold the shutter button in the halfway position until the recovery screen appears. Use the Zoom rocker button to navigate to Wipe data/Factory reset. Once highlighted, select it using the Power button. Your camera will reset to the original factory settings. If you choose to do a factory reset, all of the apps, images, and data on your internal storage will be lost. Be sure to back these items up before you begin the reset process if there is anything stored on the camera you cannot easily replace. If none of these options work to restore your camera and fix the ‘Camera Failed’ error, contact Samsung Support for further assistance. Their contact information is at the bottom of the webpage. Many of the issues that arise when the 'Camera Failed' error is present on a Samsung Galaxy smartphone are the same issues that can happen for Samsung Galaxy cameras. However, some of the troubleshooting steps are different. Specific instructions have been highlighted below when there are differences between each version of Samsung Galaxy smartphones. While we've made every effort to ensure any differences are noted, please note that some carriers install their own software on top of the Galaxy platform, which could create differences. If you encounter such an instance, please let us know at feedback@lifewire.com. Restart your Galaxy smartphone. Many issues that cause software errors can be addressed with a simple restart. On most Samsung Galaxy smartphone models, press and hold the Power button and choose Power off. Once the device is off, allow the smartphone to sit for at least 30 seconds before powering it back on. If this step doesn’t resolve the ‘Camera Failed’ error, proceed to the next step. Tap Download updates manually. Your system will check for available updates that have not been installed. If there are any, install the updates before proceeding through the remaining steps in this section. To ensure your apps are all updated, go to the Google Play Store and tap the three bar menu in the upper left corner. Tap My apps & games from the menu that appears and make sure you're on the Updates tab. Tap Update next to each app or tap Update all to update any apps that have updates waiting to be installed. After updating, check your camera to see if the error is resolved. Hold the Power button until the Power Off menu appears, then press and hold the Power off option until Safe mode appears. Tap Safe mode to restart your phone in Safe Mode. Third party apps are one of the most frequent reasons that other users have found they receive the ‘Camera Failed’ error, so don’t skip this step. Force stop the camera and clear the storage data. From the Home screen go to Settings > Apps > Application manager > Camera app, then tap Force Stop. Next, go to the Settings > Apps > Device Maintenance and tap Storage. In the menu that appears, tap Clear Data or Clean Now to clear out your cached data. Once the cache is cleared, restart your camera and try to use it to determine if the error has cleared. Remove, then reinsert the microSD card. Occasionally the Samsung Galaxy smartphone cameras will encounter an error reading the microSD card which can cause the ‘Camera Failed’ error. This appears to be one of the most successful strategies for resolving the 'Camera Failed' error on Samsung Galaxy smartphones, so do not skip the steps below. To resolve the error, power off your Galaxy smartphone. Power the phone back on and reinsert the SD card. If prompted, reformat the microSD card. Reformatting a microSD card will erase all the data on the card. If you have pictures or apps on the card you don’t want to lose, try transferring them to your computer using a microSD card reader. Turn off Smart Stay. Smart Stay works by using the front-facing selfie camera to monitor the position of your face while you’re looking at the screen for a long time without touching the screen. Because this uses the camera, it can sometimes cause a conflict if you try to use the rear camera at the same time Smart Stay is active. To solve this problem, turn off Smart Stay. Go to Settings > Advanced Features and disable Smart Stay. Now try the camera again to see if the problem is solved. Turn off your Galaxy smartphone. Reboot the phone holding the Bixby button, the Volume Up button, and the Power button simultaneously. Continue to hold those buttons until the phone vibrates. It should now boot into the Android recovery screen. On the Android Recovery screen, use the Volume Up and Down keys to navigate to Wipe Cache Partition. Select the option with the Power key. When finished, restart your phone and try your camera again. For Galaxy versions that don't have a Bixby key, Step 2 in the rebooting process is a little different. Hold the Volume Up, Home, and Power buttons to restart the phone and continue to hold the Volume Up and Home buttons until you see the Android recovery screen. All remaining instructions apply to all versions of Galaxy smartphones. When all else fails, do a hard reset. If nothing has worked up to this point, the last thing to try is a hard reset. To do so, go to Settings > General Management > Reset and choose Factory data reset. This will return your phone to factory settings and you’ll have to go through the entire setup process as if it were a brand new device. A Factory data reset will erase all apps and data from your phone. Be sure you have a backup of any information that you do not want to lose before you begin the factory reset process. If none of these steps work to fix the 'Camera Failed' error for your Samsung Galaxy smartphone, contact Samsung's Mobile Support team for further assistance.